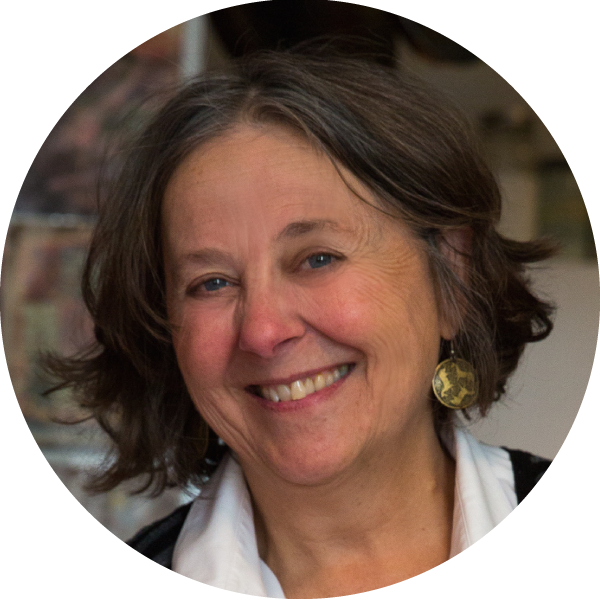 Leigh Olson: This is the heritage cookbook project podcast where we connect with cooks across the country to talk about food memories and family recipes and learn just a little bit more about one another. And I’m your host. Leigh Olson. Kate McDermott: Hi, I’m Kate McDermott. I, um, live in Port Angeles, Washington. I’ve been a home cook and a home baker all my life, uh. Baking for my family and friends and I’ve written two books Art of the Pie and also Home Cooking with Kate McDermott. All the recipes that I made, all those family and friends that I have been cooking for for decades. 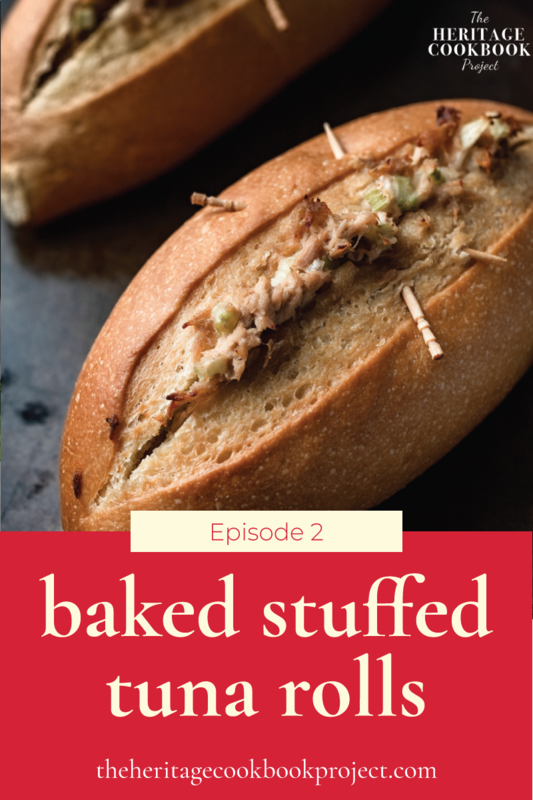 Leigh Olson: In my chat with cookbook author Kate McDermott about Baked Stuffed Tuna Rolls, I learned what concerts and meals have in common, how a Catholic working mom fed her family on Friday nights, and how the memory of a loaf of bread can transport you back to your childhood. Leigh Olson: Who inspired you to start cooking? Kate McDermott: My early inspiration in cooking was my grandmother, my grandmother, Geeg she, she cooked without recipes as did most of the people that I was surrounded with in my early life in the kitchen. The lady next door Sady Flynn, was that another one? She was an early baking mentor. Never had any recipes. Leigh Olson: There was kind of an innate ability for women to just know how to put things together. I think we’ve moved so far away from that that we have to now rely on recipes, which is, I mean I guess it’s a good thing in some instances, but in others I think it kind of hamstrings us. Kate McDermott: Yeah, I certainly have thoughts about a lot of this. We look at magazines and we look at books and we have cooking shows on television and um. They give us an idea of something and sometimes it looks like it’s unattainable or that there’s too many steps involved and “Oh, let’s just go call for takeout or, or go somewhere to eat” rather than, um. You know, it’s okay if it doesn’t turn quiet, doesn’t look or turn out quite like what you expected. It’s probably gonna be just fine and just give it a try. You know what’s the worst that can happen? Is that, yeah, if it’s really bad, you do go out. That’s plan B.
Leigh Olson: I think that’s a really good point. We, we’ve started to rely so much on recipes that we don’t rely on our intuition that we can do these things and the point about um seeing things that have been propped and styled and feel unattainable to us. I think in many senses we have really done ourselves a disservice. Kate McDermott: I do. I do agree and there’s something that I can equate that to in my previous career of professional music. We listened to musical recordings that are perfect and then when we go to a concert, if it’s not perfect, what we remember is the mistake rather than that was a live performance. And, you know, so what if there’s a mistake? I’m, I’m there in a shared space with people listening to something. Having a, having an experience with them, which is the same thing when I sit down at the table and share a meal with people. Leigh Olson: I agree and I love that. I think that that the whole part of the experience, it’s not just about what the food looks like or what it tastes like, but it’s that experience that we have with the people that we sit down at the table with. The memory that that we were going to talk about today is essentially a sandwich that your mother used to make and it’s called baked Tunis, stuffed French rolls. Kate McDermott: As I mentioned that, you know, my mom always made sure that we had dinner on the table. We sat down at six o’clock every night no matter what she worked. Uh, and was always trying to find things that were quick and easy, not really many ingredients that could just be put together and then popped in the oven and out on the table. It was a recipe that she would make for us on Fridays. You know, cause I grew up in a Catholic household and on Fridays you didn’t eat meat. So we often had these stuffed French rolls on Friday nights. Leigh Olson: Is this a recipe that she found, do you think? Or is it something that she made up? Leigh Olson: Coming up after the break, creaky wooden floors, the aroma of freshly baked bread and small, independent stores. Sponsor Break: This episode, the Heritage Cookbook Project Podcast is supported by Bob’s Red Mill. When you’re making those treasured family recipes, don’t leave the quality of your ingredients to chance. Visit bobsedmill.com to find out more about this employee-owned company, their products and how you can fill your pantry with them. With their products, not their employees. Leigh Olson: And now back to Kate and the Baked Stuffed Tuna Rolls. Kate McDermott: She would take these uh, French rolls that they’re kind of hard on the outside. I think they were probably about six inches long and they kind of were shaped like a sweet potatoes and she would slit the top of it and she would pull out the bread from the inside. So there’s a shell and then she would have taken one or two cans of, I think it was Chicken of the Sea tuna. And she would drain it and then she would take, oh, I can’t give you an exact amount others than I’ll plop or two of mayonnaise. And, uh, we were a Best Foods Family. I know that there were people that were the Kraft mayonnaise people. She liked the best foods and um, she was plop some of that into, uh, a bowl with the tuna. She would finally chopped some onions, finely chopped some celery. a little squeeze of lemon and she would mix it all together. And then she would take a spoon and she would put this back into the empty hollow cavity of the French rolls. Then she would secure the top of the French roll, two toothpicks that were done in a little “X” on top and she brushed the roles with melted butter. And she put them into an oven probably around 325 and they just heated up and the outsides got a little browner and more golden. And we loved them! They were just wonderful! But I remember going to the grocery store down the street, uh, it was about a block, a block and a half away from us and, um, Quality Foods. And they had the French rolls from Vior’s Bakery. And there was a little truck that wouldn’t run around town and deliver these rolls. The memory of that bread of being a little girl walking into that store with its wood floor. 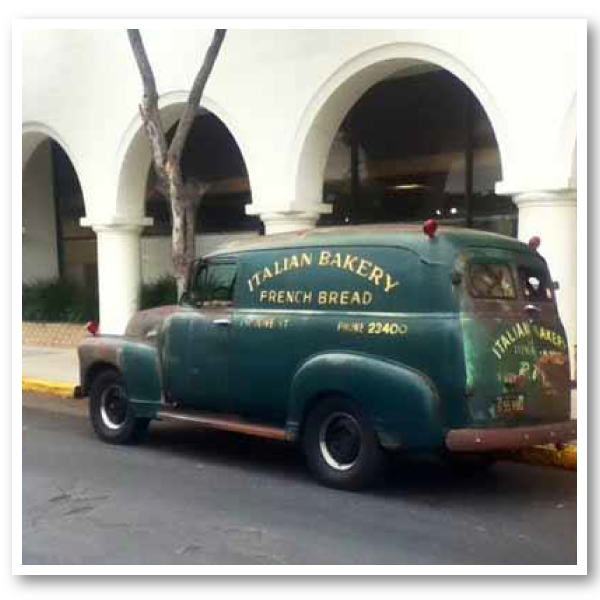 And I can remember hearing the squeaks on the floor and there was the rack that had the white bags of bread. Picking that loaf off of the rack. And it was warm, the aroma, I can just be that little girl again. Leigh Olson: I could literally see that store as you talked about walking in and the floor creaking and the, the shelves, and the bread and the, even the smell. Kate McDermott: Oh yeah. And you know, in those days, the storekeepers knew you and was just, it was so great to go into small independent stores. And you know, they would, they, there was the butcher and he knew my family and he knew my grandmother and he knew, he knew all of us and we knew his family. And we knew that the people who ran the store, and it was, um, that’s a, that’s a part of our world our life that I hope that in some ways through our things like our farmers markets that we’re still hanging onto, to some of that. Leigh Olson: Yeah. And, and I think that, I think that the food is something that does allow for that deep connection and the farmer’s markets. I know the farmers markets around the area that we both live in are really, really highly supported. And it’s so nice to see that because food is, it’s so important to us. It’s something that connects every single one of us, every single one of us eats. And um, we have memories around our food. Kate McDermott: If listeners wanted to make this, what advice would you give to them? Make sure that you get the best darn French rolls you can get! Crusty on the outside and soft as pillows on the inside. Leigh Olson: but sometimes the simple tastes are the ones that taste the best. Kate McDermott: I think simple tastes is, it’s what I think it’s with comfort food is all about. Comfort food reminds us of how wonderful it is to be with our family and our loved ones. Leigh Olson: Yes. And I think that sometimes we try to over complicate things and put too many flavors into things and when we have something so simple that, that it’s, it’s about the fresh French rolls. And it’s about the Chicken of the Sea tuna and, and there isn’t anything else. There’s no pretenses put onto it. It just is what it is and just lovely that way. Leigh Olson: Thank you for being here. I so appreciate you and all of your wisdom that you share. Kate McDermott: Thank you so much for asking me. Kate McDermott: At artofthepie.com. And I’m on the social media channels. On Instagram I’m at Kate McDermott. Um, Twitter. I’m Kate McDermott. And of course you can go to your local bookstore and support authors and cookbook writers by purchasing cookbooks and cooking from them. Leigh Olson: If you enjoyed hearing Kate’s memories about Baked Stuffed TunaRolls and want to hear more stories like this, please subscribe wherever you get your podcasts. And if you could take five minutes away from the cutting board and leave a rating and review, it’ll help me reach more people like you who love stories about food. The full recipe for Baked Stuffed Tuna Rolls can be found at the heritagecookbookproject.com. And don’t forget to register for access to the printable cookbook pages. Cheers! Oh, and the name of the bread that Kate referenced is called Pain d’Epi. It’s essentially a French baguette, shaped like a staff of wheat, although the literal translation is “ear bread” because of the shape of each of the roles. 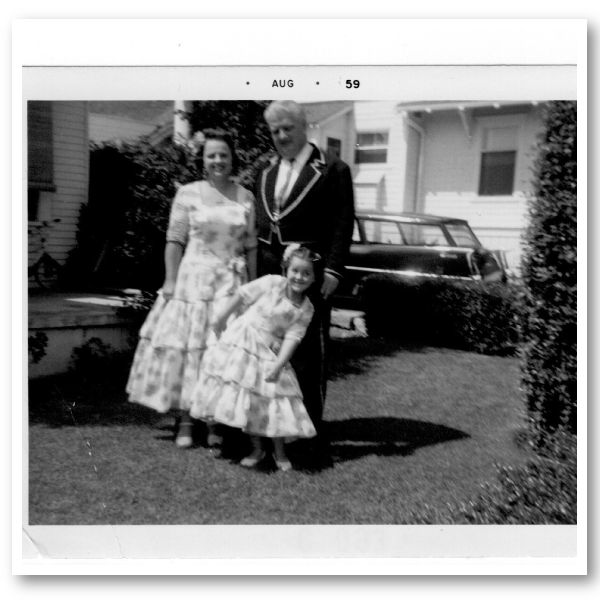 In this episode we talk about a recipe that found its way into the Santa Barbara New Press’ women’s section as part of the annual historic celebration, Old Spanish Days – Fiesta. I connect with Kate McDermott, of Art of the Pie, who shares her thoughts on concerts and meals, how aromas can transport you, and how comfort foods remind us of being with our loved ones. You don’t have to be Catholic to serve Baked Stuffed Tuna Rolls. They are great any day of the week on anyone’s table. Make a slit in the top of each of the roll. Gently pull apart and create a cavity by removing about 1/2 of the bread inside. Save the bread to make breadcrumbs for meatloaf or Spice Crumb Pudding English Pudding. Set aside. In a medium mixing bowl, add tuna, celery, onion, mayonnaise, and lemon juice stir to combine. Fill the prepared rolls with 1/4 of the filling. Insert two toothpicks creating an “X” through the rolls to hold together. Place on a baking sheet, brush the tops with melted butter and bake for 15 - 20 minutes until rolls deepen in color slightly. Serve with a salad on a Friday night or any other weeknight. Or pack them and head to the beach for a picnic. Comfort food reminds us of how wonderful it is to be with our family and our loved ones. this looks so delicious and easy enough to make! can’t wait to try 🙂 thanks for sharing. Huda, these are so simple. You can eat them warm or take them on a picnic to the beach like Kate’s family used to. Enjoy! Thanks Michael. Hope you enjoy making these. 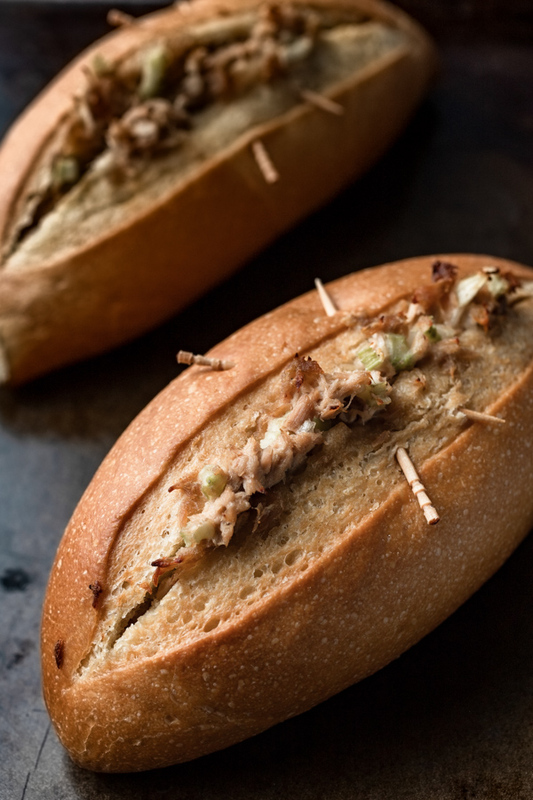 I’m not typically one for tuna rolls but this recipe looks SO GOOD. I may just have to try it out. Who knows, maybe I’ll find a new favorite recipe! Hey Kyrsten, let me know if it turns out to be a favorite. I hope that you enjoyed Kate’s story about them. The basked stuffed tuna rolls look delicious, I am pining this for future use. Awesome! Hope that you enjoy. This looks really good, and easy enough to make. It is nice to have recipes like this for when we entertain. Not too hard, especially when it comes to having a bunch of guests. These can totally be put together and refrigerated and then baked for a group. You could also wrap them in foil and take them on a picnic and warm them over a fire like Kate’s family did when they would take them to the beach. They are really pretty versatile. Oh i am doing these sandwiches for sure, i can’t can’t wait. They look delicious. So glad that you are going to try this sandwiches. And don’t forget Kate’s sagely advice of choosing the best rolls you can find, “crunchy on the outside and soft as pillows on the inside.” Enjoy! I hope that they create as many memories for you as they did for Kate. Her memories of the fresh bread and the times that her family shared is really special. Cheers! Thank you for your kinds word. I hope that you enjoy these as much as Kate’s family did and I hope that you loved listening to her story. You bet! It’s tuna recipe on a whole new level. You can serve these at a party or just snacking with some friends. Love the idea. 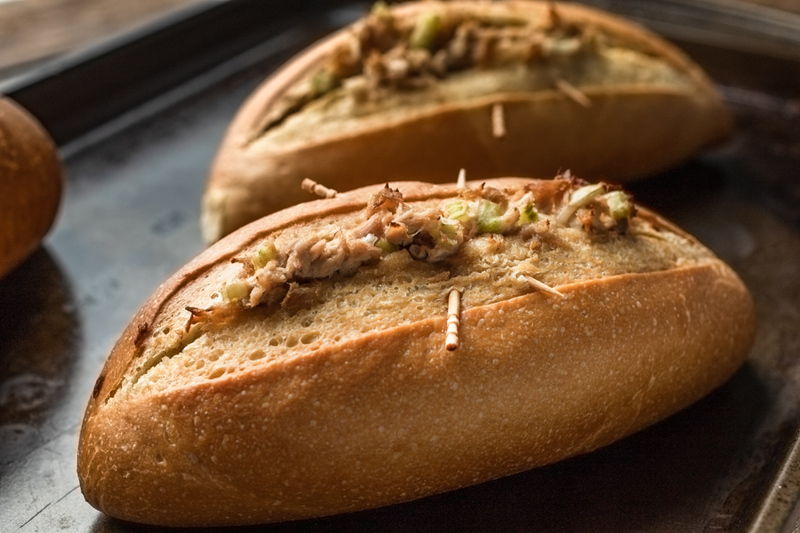 These tuna rolls are perfect to take on a picnic or to serve when friends come over. Hope you enjoyed the Kate’s story about one of her favorite childhood foods. I have never thought of baking rolls stuffed with a topping! I would love to try this with other things, too! The options are endless. You could stuff with a chicken salad or a sausage and apple filling. I hope that you enjoy experimenting with these and that you enjoyed listening to Kate’s story. Cheers! I am so thrilled to see all these wonderful comments about my mom’s recipe. Thanks so much for the opportunity to share it with your readers, and to spend a bit of time reminiscing about the days of my youth, Leigh. This is what recipes are all about – connecting, nourishing, and nurturing people:) It is my honor to include you and your story in the project. Big hugs!